Human Cost of Energy Policies | Mothers Against Wind Turbines Inc. It is hard to comprehend that communities in West Niagara and other agriculture areas in Ontario were forced against their will to comply with life changing decisions made by McGuinty and Wynne, based on lies, false pretenses and a distorted Liberal ideology. 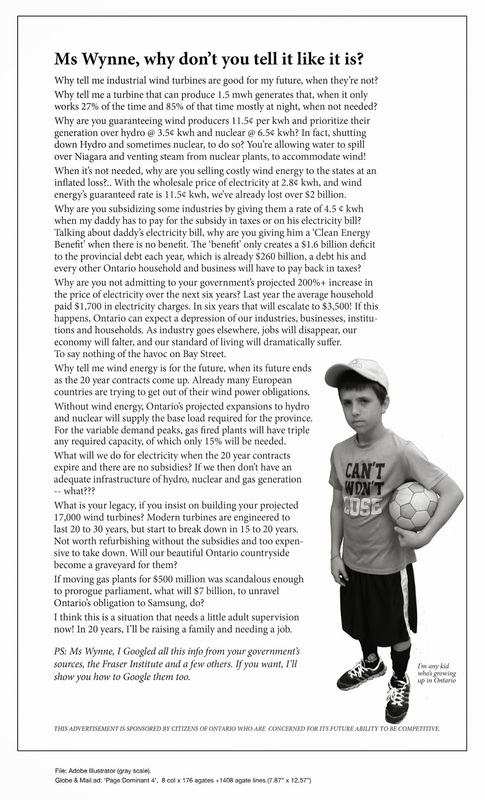 For an unreliable energy source, which generates only an approximate 3 per cent of our total energy needs, at an incredible disproportional high cost of $20 billion for these giant wind turbines and wrecking the lives of so many families living in farming communities all over Ontario is outrageous. With an absolute disregard for our already suffering economy the Liberals made our hydro the most expensive in all of North America due to incompetency, corruption and mismanagement. The gas plants before the scandal broke would have produced green energy with natural gas. Billions of dollars were spend on constructing the new tunnel at the Niagara Falls for green energy by using its water. Now it is sitting idle. This Liberal Government together with Hydro One and the Ontario Power Generation have been ripping off Ontarians in an unbelievable manner. Currently Ontario is producing an excess amount of electricity, which can’t be stored. Taxpayers have to pay Quebec and New York State many millions of dollars to take this surplus electricity off our hands. All this while many Ontarians are struggling to pay the high cost of their monthly hydro bills and there are people who have to choose between warmth in the winter or food on the table. The Wynne government has sold the majority of Hydro One, and as a result taxpayers lost control over their own hydro supply and how it is managed. The money from the sale of our utility is used by the Liberals to pay for the very large debt they created. Their policies left our economy in tatters, heavily affected by spiking hydro costs and never ending tax increases. Once elected into office, it doesn’t mean governments can discard a very large section of the population. For the extent of damage the Liberals have done to Ontario in so many ways, voters need to have recourse by impeaching this most corrupt government Ontario has ever had by making provisions our laws to make that possible. This should be a warning for all governments that voters in other areas than Toronto have rights too.